This past Monday, May 14th, the United States announced their embassy opening in Jerusalem. Leading up to and in result of this event, major conflict has occurred within that region. At the announcement, Ivanka Trump revealed the new stone that marks Jerusalem the true capital of Israel in the eyes of the United States from its previous location in Tel Aviv. The move of the embassy took place on the 70th anniversary of Israel’s independence, and marks the day thousands of Palestinians fled their homes on the Gaza border with Israel. While the United States and Israeli residents of Jerusalem were celebrating the new location of the embassy, Palestinians threw themselves at the fence separating Gaza and Israel in protest. The conflict between Israelis and Palestinians dates back to as early as 1948 when Israel was granted to the Jewish population by the United Nations. The conflict is rooted in the Jewish and Arab claims and rights to the land. The Jews believe they have rights to the land as it is a promise from God, while the Palestinians believe it is their land because their ancestors have lived there for hundreds of years. The Gaza Strip is a significant location in this conflict. According to the New York Times, the strip is home to 1.4 million people, 80% of them being Palestinian refugees. This land was then turned over to the Palestinians in the 1990s in result of the Oslo Peace Treaty. The New York Times reported that Israeli settlers remained there after the turnover, but in 2005 the Israeli Prime Minister removed the settlers, and still kept a close eye over border crossings. This was the first territory that was completely controlled by Palestinians. The conflict has continued on since then, and these two states have been in constant conflict over land, government, and power. The protests and strife between the two are often violent, and unsafe environments. The opening of the US Embassy in Jerusalem only heightened this conflict, and lead to the most violent protest on the Gaza strip since 2014. “I’m honestly just tired of this conflict in the region,” said Freshman Jacob Prinz. “It’s one issue after another”. As of right now, May 15th at 12:00 pm, the death toll of these protests has risen to 60, with the number of wounded being in the thousands. “It’s really unfortunate that so many people were injured and killed,” said Rowan Rathbun. “There is no need for violence for both sides”. 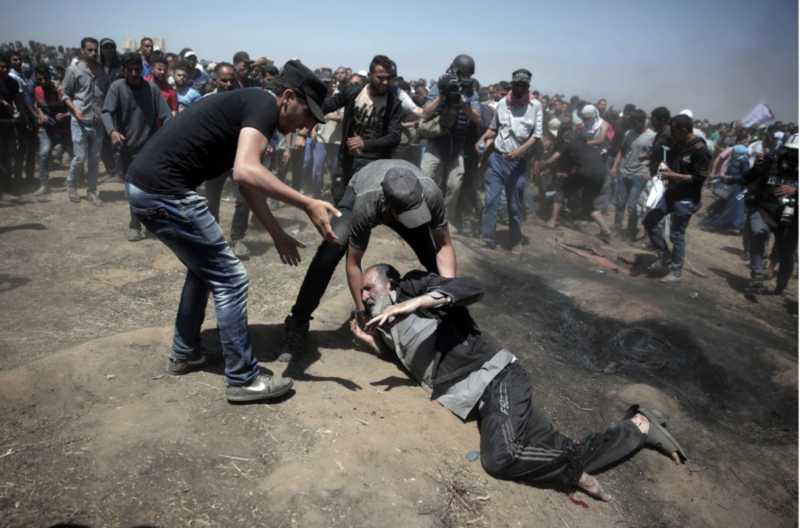 Violence between the leader in Gaza, Khalil al-Hayya, deputy chief of Hamas- a Palestinian Islamic Organization– and Israel increased after the movement of the United States Embassy to Jerusalem. “The American administration bears responsibility for all consequences following the implementation of this unjust decision,” said Khalil al-Hayya. The protests are happening on the Gaza Strip, which is a self-governing Palestinian territory on the eastern coast of the Mediterranean Sea. Since 2007, Gaza has been governed by Hamas. According to Vox.com, Israel use to have a military presence in Gaza, but withdrew in 2005 and is currently under Israeli blockade. What’s happening on the ground is that the Palestinians have attempted to rush the border, which resulted in Israeli soldiers opening fire. According to the Health Ministry, by that evening, 58 Palestinians were confirmed dead with 1,350 wounded by gunfire. Israeli soldiers used tear gas as well as live gunfire to keep protesters from entering Israeli territory. The Israeli military stated that some people in the crowd were throwing explosives, and that many people were flying flaming kites at them, one kite igniting a wildfire. Later in the afternoon, the site of the protest near Gaza City looked like a war zone. Pure chaos and anarchy, with smoke, sirens and tear gas that stretched along the fence. Emergency workers with stretchers carried off injured protesters, even some teenagers. The spokesman for the Israeli Defense Forces, Lt. Colonel Jonathan Conricus, heavily doubted the claims made by the Hamas-controlled Health Ministry; he argued that a large number of those listed as injured had suffered only tear-gas inhalation. Since 2011, there has been a massive civil war in Syria. According to jpost.com, in recent years the Syrian President Bashar Assad, along with the help of his allies Iran, Russia, and Hezbollah, has managed to turn the tide of the war to his favor. Iran is trying to exploit its help to Assad to form a permanent military presence in Syria, which Israel opposes. Israel stayed out of the conflict for the most part, and focused on managing the tension on the border with Syria in the Golden Heights, where there has been conflict between Assad and his enemies. According to jpost.com, Israel has also launched more than 100 airstrikes in Syria, with a majority of them aimed at destroying deliveries of weapons to Hezbollah in Lebanon. This has caused tension between Israel and Assad. According to Fox News, after President Trump moved the United States Embassy in Jerusalem, the alliance between the US and Israel strengthened. Fox News stated that even though Israel was ecstatic about the opening of the new embassy, the people of Palestine were disappointed, to say the least. The Israeli army had heavy security on their side as thousands of Gaza residents headed toward the Israeli border. Since March, there have been weekly marches and thousands of Palestinians have been killed and injured by the Israeli Defense Force (IDF). Jonathan Silver, a student at de Toledo High School in Los Angeles, reflected back on Israel’s past administration in comparison to this one. By moving the embassy to his perceived capital of Israel, Jerusalem, Donald Trump has kept his promise from the campaign trail and a promise America made in 1995, called the Jerusalem Embassy Act, that became a law under the Clinton Administration. He rallied supporters by vowing to buck the system and make his mark in the Middle East. Senior Jonathan Woolsey finds that this decision is overall beneficial in repairing this divided nation. Although it has caused unrest in the short-term, it could be important in mending the two opposing groups by recognizing the widely-accepted capital of Israel. “I personally feel like its a smart move by Trump,” said Woolsey. Following Trump’s decision was a new goal: to create “lasting peace” between the two groups occupying Israel. Many believe that this move put the country in an even worse state. The United States has made itself known as the global police throughout history, but the destruction and violence between demonstrators and police have made many question America’s true roles around the world. According to NBC News, Palestinians living in the poverty-stricken Gaza Strip see this as a blatant slap in the face and as a result, resent America for following through with the embassy move. US-deemed terrorist organizations like Jihad and Hamas are major backers of the protests, which was a primary impetus for Trump to take action. Seattle is often seen as a “liberal bubble,” where most individuals agree that Donald Trump’s policy has been questionable at best. Bishop Blanchet Junior Chuck Link agrees. “I just feel like we shouldn’t be there,” said Link. Donald Trump made this move amid much opposition, which primarily shows his stubborn attitude and his need to appeal to his fanbase. The conflict will continue for many years to come, and although we as students living in Seattle may want to express our opinion, we will never be able to fully understand how this conflict has affected the people of that region. As a community, we must remain objective and partisan when confronting issues like this, but also stay informed to know what is going on in the world around us. 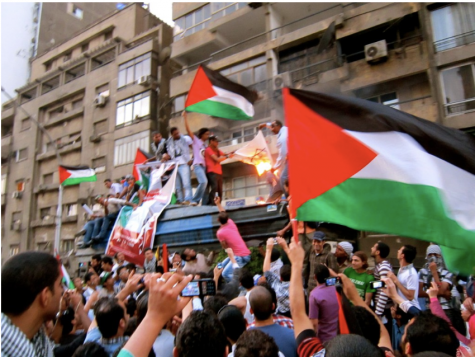 A HISTORY OF CONFLICT: Palestinian protesters join together and rally while burning the Israeli Flag at an embassy in Cairo. This protest took place in 2011, showing the ongoing conflict between these two countries.